He arrives in the early morning and occasionally in the evening - has been for the last week or so. He's tempted by the 'Pig Face' and I am captivated by his knowing expression. "I've been here before, you know," he says. He doesn't appear to mind too much that I'm lurking in the garden, angling for a decent photo. His colours are intense in the early morning sunlight: his Robin Hood mantle with its mint green blaze and his crimson suit seem an odd camouflage. He seems quite alone. These parrots are said to mate for life. Where is his wife, I wonder? Funny, I thought they wouldn’t. He’s always quite obvious in our garden, but we don’t have tall trees. Absolutely gorgeous. It must be amazing to have such a spectacular bird visit your garden. I do enjoy the visits so much. These parrots can become quite tame, though I’d hesitate to feed them because we go away a bit and I wouldn’t like them to be dependent on us. Lovely photo. I have only ever seen one parrot alone, the ones that come to our garden are always in pairs…maybe you parrot is a bachelor …at the moment! Maybe he is a bachelor, or maybe as Gerard (below) said, perhaps his wife is sitting on eggs. It’s the time of year for it. I reckon the wife is sitting on eggs, no doubt a result of his amours… Of course ‘mating for life’ he says to any female willing (and foolish enough) to listen. 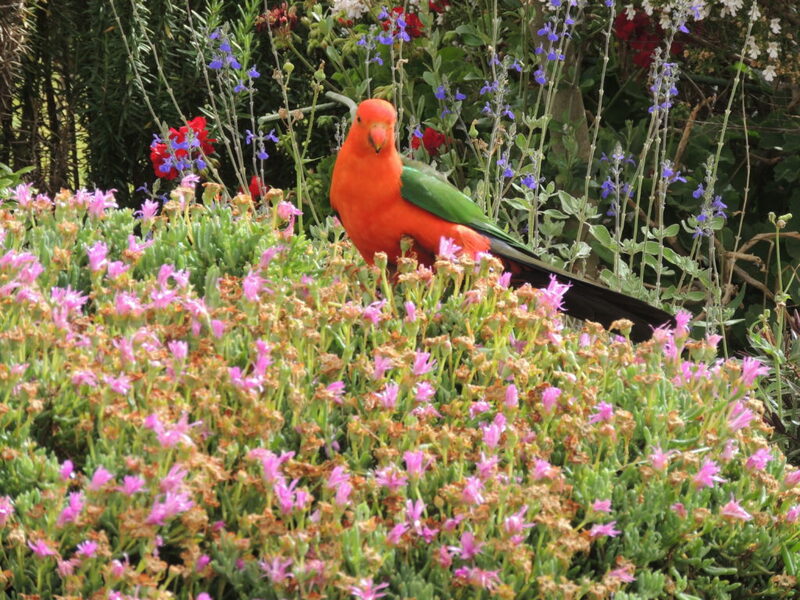 We too get the king parrot visiting us, as well as doves, rosellas and magpies. You could be right Gerard, and I didn’t think of that – not very creative of me really! What a beautiful bird! It must be wonderful to have creatures so personable in the garden. I would worry about the parrot sorts being somewhat destructive – are they? King parrots are not destructive, but some of the others such as cockatoos and galahs can be agricultural pests as they feed on seeds. Here is an interesting article about other damage that cockatoos caused! When we had our olive trees, various types of parrots sometimes ate the olives, which was surprising to us because olives taste bitter straight off the tree. He’s very handsome, Jane. Who would have thought that they like to eat Pig Face? What a delight to have him in your garden. My avian vet tells me mating for life means just that. If something tragic happens, they will often find a new mate. Let’s hope there is a lady for him somewhere. It was a surprise to me too, about the Pig Face, Tracy! It must be quite a delicacy. Maybe his lady is sitting on a nest as Gerard suggested, but he didn’t look as though he was getting any food for her, if she was. Wow! That is one gorgeous bird! Yes, he is Derrick. I love to see him in the garden. You have the coolest birds in your country. He looks really big, how long is he? King parrots grow to be around 43cm long, including the tail, and they can live for 25 years! I am confused about ‘pig face’ but am guessing that this is the plant it is eating? I love King Parrots. Hope you get to meet the female soon, and maybe some babies? Oh yes, the Pig Face! I haven’t been able to discover why this plant has such a name which seems to be a collective name for a number of plants: Carpobrotus glaucescens, Lampranthus, and Mesembryanthemum. It is also called ice plant. Some Pig Face plants are native to Australia and some are from South Africa. When the sun is out, they are magnificently colourful. Some baby parrots would be wonderful, but my trees are not big enough (or the right kind) for parrots to nest in. So very beautiful! What a treat to have such a handsome visitor to your garden. Thank you for sharing him with us. I’m glad you enjoyed seeing him, Cindy. Oh, I hope he just hasn’t met his match yet! Or perhaps, that his lady is brooding over eggs? He’s a handsome fellow. I can never get over how colorful the birds in your part of the world area. There are wild parrots here too, the progeny of escaped pets, but I’ve yet to see any appear in my own garden. They seem to travel in large, noisy flocks, focusing on date palms. I hope that’s the explanation, Kris. We also have large flocks of parrots: the rainbow lorikeets in Sydney congregate in trees in the evening and the noise is tremendous! Also, flocks of cockatoos and galahs can cause a lot of crop damage. However, the King parrots seem to travel in very much smaller groups and to be quite polite! I hope she is alive and well, somewhere. Lovely photos, Jane. We’ve had some small parrots, bright green with vivid red beaks, feasting in our bottlebrush recently. I don’t know what type they are, but they are very entertaining to watch. I hope yours finds a girlfriend soon. I tried to work out what you parrot might be, and the only bright green one with a red beak was scaly breasted lorikeet. I wonder if that’s what yours is? It’s wonderful to have parrots visiting the garden. Wonderful shots of the Australian King Parrot. I wish we had them visit down in my urban area, but I have to be content with seeing them up on my brother’s 10 acre hobby farm in the country. They’re an amazing sight when you see a few of them together. His wife is probably sitting on a nest? I hope she is, Vicki. However, if he has lost her, he’ll probably get another one! I do enjoy the visits, Lis. I haven’t seen him since I posted, so I hope he’s found his partner somewhere. Stunning bird–wonderful photo! Gave me an opportunity to look up “pigs face plant”–the Carpobrotus that is a coastal invasive here is the SA species, not your Australian version. Australian common names for plants are the best! How do you come up with them? Lilly Pilly, Pencil Pine–they’re all so fun and creative! I think these names have been used for generations, hb, so I don’t really know where they originated, and funnily enough I’ve never really thought about them. Now that you’ve mentioned it, I’ll be sure to notice them more! Btw, I have commented on your posts a few times, but the comments don’t seem to appear. I read your posts and enjoy them. Just wanted you to know. What a beautiful bird. So serene. What a beautiful bird! I hope he finds his wife, and that they settle in your garden.